YANG Fan, CHEN Yingjian, WU Yanhua, HU Chengjin. Establishment of a Method for Detecting Kallikrein 10 in the Serum and Its Clinical Application[J]. Journal of China Medical University, 2018, 47(4): 299-304. Abstract: Objective To establish an ELISA method for detecting kallikrein 10 (KLK10) in the serum, and evaluate KLK10 as a biomarker for breast cancer.Methods The KLK10 ELISA assay was established and its efficiency was evaluated. 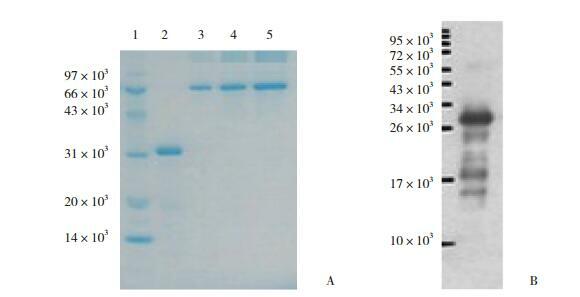 Then, using this method, the serum KLK10 levels in all the samples were quantified. The correlation between KLK10 level and clinicopathological features, and the clinical value of KLK10 were analyzed.Results The serum KLK10 level in patients with breast cancer, patients with benign breast disease, and normal controls was found to be 0.88±0.45, 1.35±0.56, and 1.57±0.88 ng/mL, respectively. The KLK10 levels in patients with breast cancer were significantly different from those in patients from the other groups (P < 0.05). The sensitivity, accuracy, and Youden index of KLK10 detection in the breast cancer samples were higher than those for CEA and CA 153 detection, which proved that KLK10 has potential as a new serum marker for breast cancer.Conclusion The KLK10 ELISA assay was established successfully and KLK10 could be detected in the serum samples. The presence of KLK10 in the serum was closely related to the occurrence and development of breast cancer, and KLK10 has potential as a marker for breast cancer. 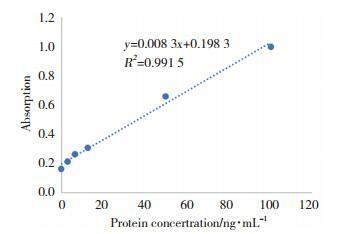 PC，protein concentration；DC：determination concentration；RSD，relative standard deviation. LUO LY, GRASS L, HOWARTH DJ, et al. Immunofluorometric assay of human kallikrein 10 and its identification in biological fluids and tissues[J]. Clin Chem, 2001, 47(2): 237-246. LI B, GOYAL J, DHAR S, et al. CpG methylation as a basis for breast tumor-specific loss of NES1/kallikrein 10 expression[J]. Cancer Res, 2001, 61(21): 8014-8021. LUO LY, BUNTING P, SCORILAS A, et al. Human kallikrein 10:a novel tumor marker for ovarian carcinoma?[J]. Clin Chim Acta, 2001, 306(1/2): 111-118. 阮贝鸿. 探索乳腺癌细胞系中曲妥珠单抗耐药相关的生物标志物[D]. 杭州: 浙江大学, 2016. BABLOK W, PASSING H, BENDER R, et al. A general regression procedure for method transformation. Application of linear regression procedures for method comparison studies in clinical chemistry, Part Ⅲ[J]. Clin Chem Clin Biochem, 1988, 26(11): 783-790. LIU XL, WAZER DE, WATANABE K, et al. Identification of a novel serine protease-like gene, the expression of which is down-regulated during breast cancer progression[J]. Cancer Res, 1996, 56(14): 3371-3379.